Football Similar To Car Crashes? Football players were struck in the head 30 to 50 times per game and regularly endured blows similar to those experienced in car crashes, according to a Virginia Tech study that fitted players' helmets with the same kinds of sensors that trigger auto air bags. University researchers are compiling a database of blows to the head that their starting players endured this year, with plans to study how much trauma the brain can take. The study adds to a growing body of research into concussions, the blows to the head that helped end the careers of quarterbacks Troy Aikman of the Dallas Cowboys and Steve Young of the San Francisco 49ers, among others. The data so far surprised team physician P. Gunnar Brolinson, who said he didn't realize players were absorbing so many serious hits, especially since only about five came off the sidelines this season with concussions. "There are probably factors that we don't fully understand that make players better able to withstand higher accelerations (football hits) than other people," he said. It's possible that some players can withstand stronger blows because they have stronger neck and shoulder muscles or that they're simply more robust genetically than others, Brolinson said. The researchers recorded 3,312 hits during 35 practices and 10 games this season, rotating eight specially fitted helmets among 38 players. Project leader Stefan Duma said offensive linemen endured the most hits, followed by defensive linemen, running backs, linebackers, wide receivers and defensive backs. Quarterbacks recorded the fewest hits. "If you ask somebody what kind of head injury are you going to worry about, everybody thinks of the receiver running down the sideline getting popped by the safety," Duma said. "But to me, the interesting part is going to be these lower speed but high frequency hits we're seeing on the (offensive and defensive) line. The fact that these players are getting headaches all the time after every game, there's something going on there." Duma, an engineer who specializes in car crashes and safety equipment, plans to use the data to improve protective gear for players. The data also could help researchers understand and prevent concussions, a common condition in college football that can be hard to diagnose. The helmets measure hits in multiples of the force of gravity. Half of the hits recorded this season were greater than 30 Gs, Duma said. The hardest hits measured more than 130 Gs. "An impact of 120 Gs would be like a severe car accident, which you could survive if you were wearing a seat belt," Duma said. Duma said Tech plans to expand the program using more helmets next year. With enough monitoring, he said, medical staffs should be able to reduce football concussions by accurately predicting the number and degree of blows a player can handle. The monitoring helmets were developed by SIMBEX, a New Hampshire company that develops safety equipment. 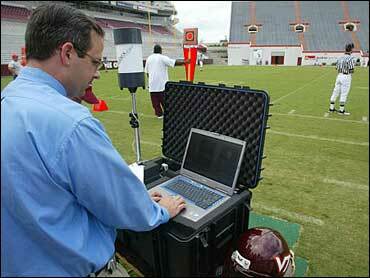 The system transmits the angle and severity of impacts from the helmets to a laptop Duma monitors from the sidelines. SIMBEX founder and owner Rick Greenwald said his company will begin selling the monitoring system this year. Equipping a team of 50 to 75 players would cost $165,000 to $195,000, Greenwald said.